Trilobites are an extinct group of arthropods (the same phylum that contains insects, spiders, crustaceans such as crabs and lobsters, centipedes, millipedes, etc.). They first appeared in the early Cambrian period about 530 million years ago, were largely wiped out during the late Devonian mass extinction about 364 million years ago, and finally went completely extinct during the Permian-Triassic mass extinction that took place 248 million years ago. 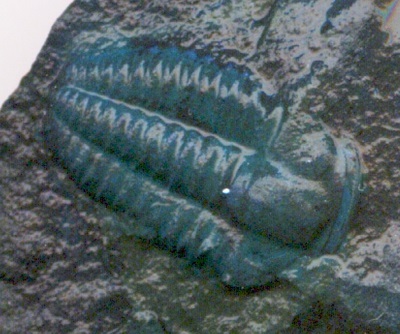 Trilobites are one of the most well-known fossil groups, and highly diverse, and are found in many different locations. Over 17,000 species are known from fossils, which are usually just of the animal's exoskeleton, although occasionally soft bodies are also found in fossils. The fact that Trilobites are so widespread and diverse, and that they evolved rapidly over time, often allows their use as "index fossils" - that is to say that rocks can be dated based on the particular type of Trilobites found within them. During life, all Trilobites are believed to have been exclusively marine organisms, although they do appear to have led many different lifestyles. 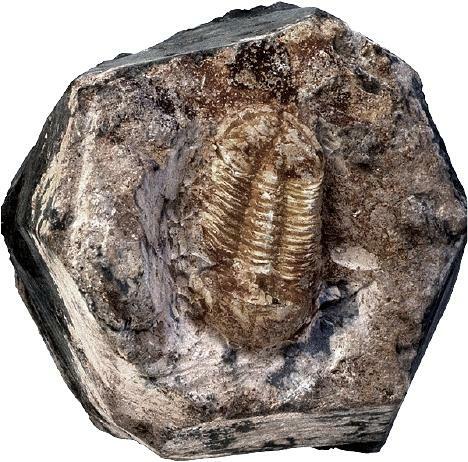 Trilobites lived in both shallow and deep water, and although most lived in the seas, there is some evidence (such as trace fossils) that some species may have been able to live in freshwater. Various different types of Trilobites are believed to have been swimming plankton feeders, predators, scavengers, and in some cases, to have even got their food from symbiotic sulfur-eating bacteria. One final interesting fact about Trilobites is that they are not thought to have been able to cross deep oceans. Thus, the presence of two distinct types of Trilobites (as well two distinct types of Graptolites) of Trilobites in the rocks of Europe and North America is suggestive that an ocean (known as the "Iapetus Ocean") once divided the two continents. The Iapetus Ocean is thought to have closed-up again when all the continents joined together in the super-continent of Pangaea - when a new ocean (the Atlantic Ocean), separating Europe and North America, did subsequently form when Pangaea broke up, it did so along a different line of separation. With Trilobite, Richard Fortey, paleontologist and author of the acclaimed Life, offers a marvelously written, smart and compelling, accessible and witty scientific narrative of the most ubiquitous of fossil creatures. Trilobites were shelled animals that lived in the oceans over five hundred million years ago. 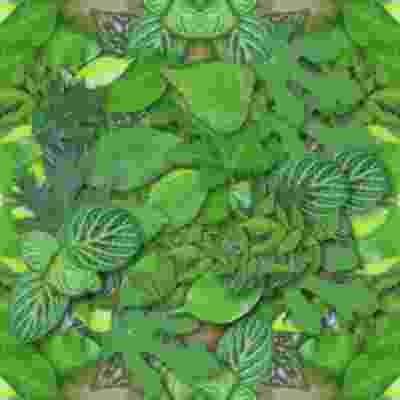 As bewilderingly diverse then as the beetle is today, they survived in the arctic or the tropics, were spiky or smooth, were large as lobsters or small as fleas. And because they flourished for three hundred million years, they can be used to glimpse a less evolved world of ancient continents and vanished oceans. Erudite and entertaining, this book is a uniquely exuberant homage to a fabulously singular species. Distant relatives of modern lobsters, horseshoe crabs, and spiders, trilobites swam the planet’s prehistoric seas for 300 million years, from the Lower Cambrian to the end of the Permian eras―and they did so very capably. Trilobite fossils have been unearthed on every continent, with more than 20,000 species identified by science. One of the most arresting animals of our pre-dinosaur world, trilobites are also favorites among the fossil collectors of today, their crystalline eyes often the catalyst for a lifetime of paleontological devotion. And there is no collector more devoted―or more venerated―than Riccardo Levi-Setti. With The Trilobite Book, a much anticipated follow-up to his classic Trilobites, Levi-Setti brings us a glorious and revealing guide to these surreal arthropods of ancient Earth. Featuring specimens from Bohemia to Newfoundland, California to the Tucson Gem and Mineral Show, and Wales to the Anti-Atlas Mountains of Morocco, Levi-Setti’s magnificent book reanimates these “butterflies of the seas” in 235 astonishing full-color photographs. All original, Levi-Setti’s images serve as the jumping-off point for tales of his global quests in search of these highly sought-after fossils; for discussions of their mineralogical origins, as revealed by their color; and for unraveling the role of the now-extinct trilobites in our planetary history. Sure to enthrall paleontologists with its scientific insights and amateur enthusiasts with its beautiful and informative images, The Trilobite Book combines the best of science, technology, aesthetics, and personal adventure. It will inspire new collectors for eras to come. Trilobites are small water animals that lived long before the dinosaurs. Some of the richest trilobite fossil deposits in the world are found within the Chickasaw Nation's boundaries in southern Oklahoma. Good Night, Trilobite is a story about Tony the trilobite and his friends, Becky the brachiopod and Bryan the bryozoan, who lived 415 million years ago on the sea floor of what would one day be the Chickasaw Nation. When a hungry cephalopod named Seth shows up, Tony and his friends find themselves in trilobite trouble! This fun and educational introduction to creatures from the Paleozoic era and the fossils they left behind includes a glossary of scientific terms, Chickasaw language vocabulary words, and a downloadable version of the Trilobite Song, written and performed by author Steve Vanlandingham. A survey of representative trilobite species from North America. It includes meticulous line drawings of 42 species, with information for each concerning classification, geologic range, and geographical distribution. Descriptions of probable life style, similar species, interesting features, etc. are also given.The 8 page, illustrated Introduction includes discussions of trilobite anatomy, growth, vision, lifestyles, locomotion, feeding, classification, and extinction. A brief "suggested reading" list is also offered. A photographic guide to Oklahoma¿s Devonian trilobites. The geological history of Coal County, Oklahoma. Descriptions of rock formations where trilobites are found. Excavation and restoration of trilobites. A photographic atlas of the Lower Devonian trilobites of Oklahoma, with helpful information to aid in their identification. Trilobites are a well-known fossil group, possibly second most famous only to dinosaurs. With their easily fossilized exoskeleton, they left an extensive and diverse fossil record. They began a drawn-out decline to extinction during Late Devonian time, when all but one of the trilobite orders died out. This meticulously researched reference guide is a photographic atlas and descriptive compendium on the trilobites of Coal County, Oklahoma. The species described lived during the Lower Devonian in a shallow tropical ocean that had advanced over the landscape of North America. More than twenty species are exquisitely preserved in Oklahoma¿s limestone rocks. Each species is carefully illustrated, including thorough descriptions, so that those familiar and unfamiliar can understand and appreciate these amazing creatures. The most current scientific research on these trilobites is also included. For those wishing to pursue a deeper interest in trilobites, a comprehensive bibliography lists hundreds of sources of information for further study. If you love trilobites, this is the coloring book series for you! Wikipedia Illustrator Stanton F. Fink presents his reconstructions of extinct species, both famous and obscure, for the coloring pleasure of everyone, their inner child and their outer child, as well as information about each bygone creature. This 34 page coloring book will help children and adults learn about trilobites! What they were, where they lived, when they lived, fascinating facts about them, and a fun game to play! The Georgia Mineral Society is a completely volunteer, non-profit 501(c)(3) organization dedicated to educating the youth of the state and members of our society in the field of Earth Sciences. All proceeds above cost will be used to further education in Earth Sciences and to support the educational efforts of the Georgia Mineral Society.